BizarroBlog: Gimp Goat Gets Gift! My good friends and cohorts at Woodstock Farm Animal Sanctuary are on the front page of the Metro section of today's New York Times! Here is the more legible online article. What they didn't mention is that we have over a hundred animals under our care, we offer fun and friendly tours all Spring and Summer (are those words supposed to be capitalized? I think not, but it always seems to me that they deserve it. Winter, no, but Spring and Summer? HELL yes!) and that we are raising money to build a small medical facility for our critters. At present, Doug and Jenny are treating these guys in the foyer of their home. What a drag. Click here for info on how to toss a couple dollars at a good cause. I can personally guarantee that every penny of your dough will go to the critters. No misappropriation of funds here, I assure you! Here's a dandy picture of the original board members who built the farm, along with many valuable and saintly volunteers. From left to right, Sergio La Vaca (star of Spanish children's TV show, "El Mono Loco! 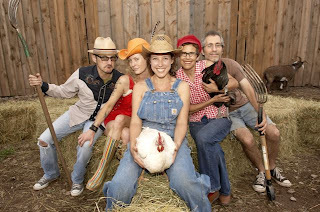 "), CHNW, Jenny Brown with Robin the chicken, Dawn Ladd with Brandy the rooster, Doug Abel with Elmo the pitchfork, and Haley is the shy goat in the back. Come visit us this year and meet the critters. You won't be sorry and you'll have a little less bad karma to burn off when you die.